Rich, intense blackberries with just the right touch of red chile spice - a totally different take on pepper jam! Amazingly tasty on nut butter toast but check it out on cream cheese, goat cheese log (seen above) or brie. Delicious with salmon, lamb and pork. An elegant, well-balanced, versatile condiment on your table. Click on product name for picture. 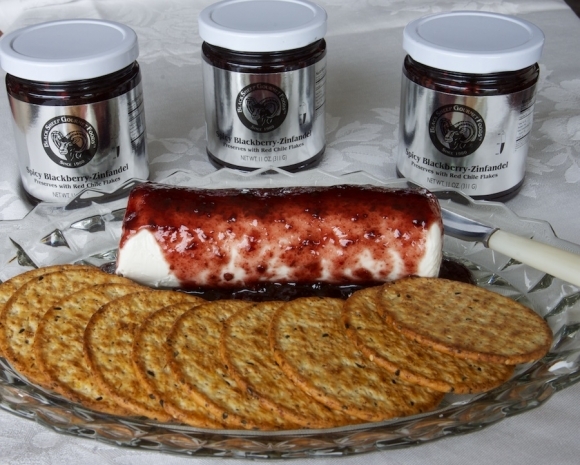 has come to serving (room) temperature, spoon our Spicy Peach-Chardonnay Preserves over the top of the cheese wedge. Click on product name for picture. spread whipped cream cheese on your favorite cracker or crostini, place a piece of smoked salmon on the cream cheese and top with a spoonful of the Spicy Raspberry-Syrah Preserves. Serve and enjoy the compliments! Click on product name for picture. Beguiling blend of rich blueberries & merlot wine reduction with a hint of orange blossom honey. Incredibly delicious on nut butter toast, biscuits, scones, ice cream, cheesecake and more!